Last spring I received an email about a gig in town featuring visiting musicians from California and Chicago. Trumpeter/percussionist Dan Godston was looking for some promotion for his Stir Trio project, and after posting some information on Jazz Police, I decided to check out the performance at the Acadia Coffee House. With Dan on trumpet, Joel Wanek on bass, and Jim Ryan on sax, they carried on a far-reaching conversation through the language known as “free jazz.” You never knew where it would go next, and some of the sounds were jarring, but it was fun to watch, to see the musicians interact. Off and on during the spring and summer, Dan, Joel, Jim and various cohorts performed throughout the Midwest and east coast, recording bits and pieces wherever they went. In January, Jim put it all together on CD as The Ghost Dog Tour. Stir Trio was one ensemble represented on the tour, along with Jim’s Forward Energy. Dan, Joel and Jim typically form the core of whatever band is designated. Eager to tour the Midwest again, Jim Ryan summoned Forward Energy for a series of gigs in the Twin Cities, Chicago, and Champaign. This time he brought in another saxophonist, Alicia Mangan, from Los Angeles, and local prophet Steve Hirsh served behind the trapset. The band opened at the Black Dog Bar in St. Paul’s Lowertown, closed its weekend at the Clown Lounge beneath the Turf Club in St Paul’s Midway district, and in between performed in a small concert hall setting at the Center for Independent Artists in south Minneapolis. Free jazz doesn’t often attract a large crowd, and not in a market where even pure straight-ahead rarely fills a small club. There were maybe a dozen eager listeners at Black Dog, which has a small performance space that allows about a dozen listeners. In the small theater at CIA, on a cold Sunday night, maybe two dozen watched and listened. There was enough energy on stage to fuel a full house. 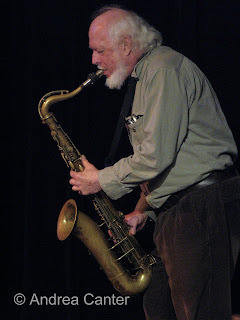 Free jazz, as Jim puts it, is “music you have not yet heard”—created in the moment with little if any prior consideration. It requires the utmost in listening among the musicians to avoid total chaos, and sometimes chaos seems to be the goal. Just listening, I am easily lost, distracted by one sound or another, confused in my effort to impose structure where none exists or where none aligns with a familiar form. My first encounters with Cecil Taylor and Ornette Coleman were frustrating. But in the past few years I’ve had the opportunity to see free improvisation as well as hear it. I watched as Bill Carrothers, Gordy Johnson and Dave King engaged each other in a spontaneous exchange that was recorded and released as Shine Ball. I attended a ten-piece ensemble performance by Anthony Braxton’s band at the Iridium in Manhattan and found myself watching the musicians with far more intensity than I usually apply to mainstream groups. Suddenly the cacophony of sound made some sense because I could see the resource, appreciate the interaction. Forward Energy, like the Stir Trio six months earlier, had to be seen to be heard, at least for me. The communication among musicians takes the call and response concept to the outer edge, maybe beyond to a soundscape without clear edges or signposts. And always the energy moves forward. Steve Hirsh must burn a thousand calories per session, the rhythmic drive never ceases although it shifts like the rearranging of tectonic plates beneath the continent. Joel Wanek keeps the heart beating but with an arrhythmia that fuels the ensemble body like a constantly charging pacemaker. The two saxophones play yin and yang, honking and fluttering and at times offering melodic interludes that dissolve into bird calls and foghorns. Jim Ryan, the true Renaissance Man who exhibits watercolors on the walls of CIA and offers spoken word stanzas that could be leftover from the era of beat poets, pushes and prods. Mangan could go head to head with the likes of James Carter, epitomizing “forward energy” with every phrase. My eyes focused on Dan Godston most often, perhaps because he had the most diverse arsenal of all, his trumpet of course but also an array of percussion tools and mutes, and a short attention span, blowing a phrase, grabbing a mallet, directing his menagerie of aural eccentricities in response to his cohorts. I’ve listened to Ghost Dog Tour and it takes repeated encounters for me to come close to recognizing what is obvious live, that the energy roils up from a deep well of invention times five, that anything goes in extending a musical conversation that provokes response not only from each musician but from the audience as well, silent perhaps but nevertheless engaged by the energy of artistic creation that unfolds without rules, without compromise. And maybe you have to see it to hear it. 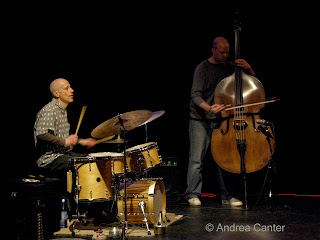 Photos: Jim Ryan (left); Steve Hirsh and Joel Wanek (right) at the Center for Independent Artists in February. Photos by Andrea Canter.